If you change the query to a Cross Resource query using the template in the document linked below, you get a 400 error with this message. 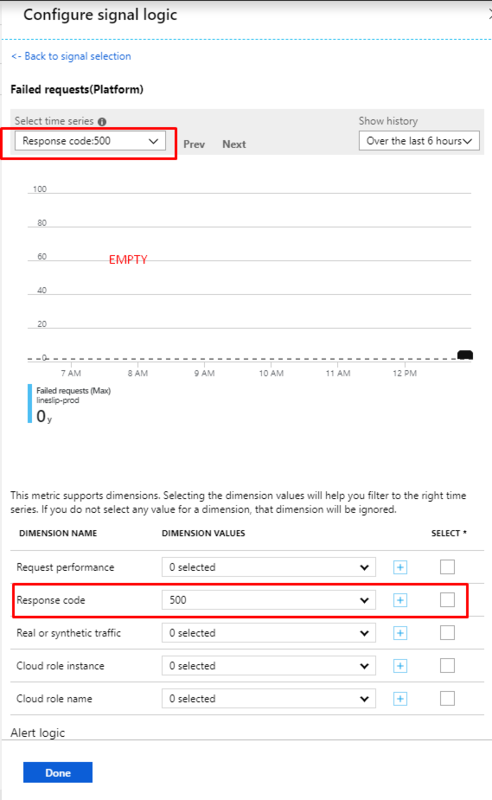 I can take the exact same query and make an alert in the portal against the same Application Insights instance without issue. "value": "properties.search.query is not a valid log or metric query.Response status code does not indicate success: 400 (Bad Request)." Most of our alert rules are variants/copies of each other: same alert target, same action group, similar search queries, evaluation logic etc. It would be great if we could simply clone an existing alert rule (and modify it as needed) instead of creating one from scratch each time. When viewing an alert smart group there's a possibility to select and edit all alerts at once. The issue is, that the "select all" option only selects the visible alerts of the current page. It doesn't select all alerts of all pages. If there are lots of alerts in a smart group it's very painful to iterate through all pages and process the activities for every page. It would be very useful to change the behavior of the "select all" option to really select all alerts (including alerts of other pages) or to add further select option to enable the desired activity. Allow app insight integration with third party (azure service bus, event hub, IFTTT, Slack). Allow sending metrics or alerts on a schedule or on trigger to third party. For example, send alerts to Slack. We can gather Available MBytes (\Memory\Available MBytes) of Cloud Service as App Insights telemetry with setting Diagnotics configuration as pic1.png. However, I don't know how can we determine the supplementary unit for that when we want to set an alert rule. The unit of it appears just "count" as pic2.png. Also, as far as I checked, it is not "MBytes" but "Bytes" contrary to the name of the counter. It would be nice if all unit of counters are displayed clearly. We use group email address in our product in order to get email from azure monitoring alerts to specific teams/goals. We found out that if a single person unsubscribe from the email alert sent from app insight the entire group will not be able to receive an alert email. We can monitor it, but cannot create an alert rule. Move Application Insights Availability Alerts to Preview Format. As of now only classic is supported and 3:rd parties like OpsGenie does not support this anymore. 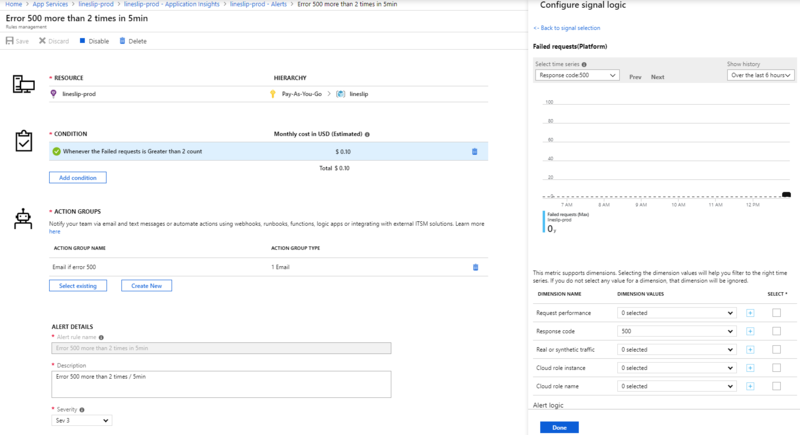 We generate Azure Application Insights resources via ARM json templates and also need to generate the Scheduled Analytics and matching alert for those AI resources so we can reliably recreate the identical setup across environments. See attached for Azure Portal examples of what we need automated. Add the ability to specify one or more conditions to trigger an alert. For example, "Availability > 0 AND Function Count > 0" over last 5 minutes. Also it would be nice to have some alerts running only between specific times hence the request for an optional CRON time (using UTC timezone). For example, "Alert to run only between 9am - 5pm". Display actual time the problem occurred in email body. When it actually happened 3/20 8:00 PM - 3/21 7:59 PM. If you are going to put the information in the email it should at least be accurate and useful. Individual check boxes for notifications so we can choose to only alert e.g. contributers in smart detection settings for alerts. Individual check boxes for notifications so we can choose to only alert e.g. contributers in smart detection settings for alerts Now there is only one check box that notifies subscription owners, contributors and readers. I created the alert rule with metrics alert (Failed requests(Platform) - on error code 500 ). As a frequent deployer of resources in Azure, I'd like to see support for showing scheduled query rules in resources.azure.com so that I can ease the authoring of new rules based on existing ones. It would be very helpful when creating an Alert Rule in the App Insights Analytics blade in the Azure portal if we could export the ARM template for the Scheduled Query Rule that's about to be created, similar to the way we can export the "Automation Script" when creating other resources. This would be useful for helping us automated our monitoring in ARM templates as part of our CI/CD process. When editing a rule in "Smart Detection settings", you can only choose between email and webhooks as a notification option. It would be nice to utilise existing action groups configured within Azure monitor. Integration with action groups will become supported for the “Failure Anomalies” detection rule in the coming weeks, as part of the transition from classic alerts (more info here: https://docs.microsoft.com/en-us/azure/azure-monitor/platform/monitoring-classic-retirement). Action groups support for the other Smart Detection rules is also in our backlog, but there’s no ETA for this yet.